The new year is a great time for fresh starts and new goals. Our family is particularly anxious to put 2018 behind us and we're fervently praying for 2019 to be filled with family adventures, health, and nothing exciting at all. I've had my fill of surprises in 2018 and appreciate the growth that all of the unexpected activity has brought into my life. 2018 has been a year of tremendous emotional, spiritual, and marital growth. We have been blessed. Keeping with tradition, we will be scarfing down our black eyed peas tomorrow in the form of a yummy pork based soup. 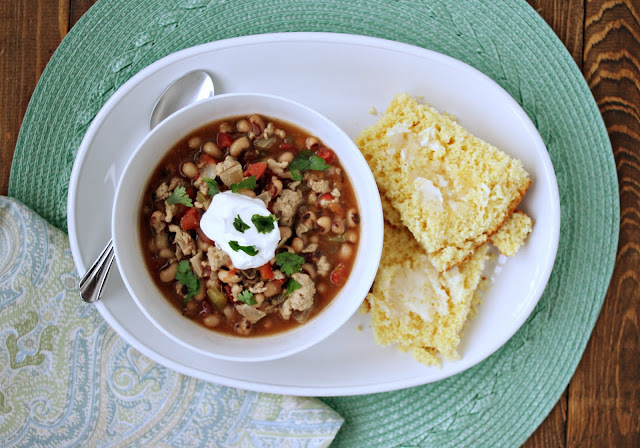 In an attempt to combine the northern tradition of pork and sauerkraut (cabbage) with the southern tradition of black eyed peas and cornbread, this soup was born. In a large pot, stir together pork and onion and cook until the meat is no longer pink. Drain excess fat and return meat/onion mixture to pot. Stir in garlic and heat for just a couple of minutes then add the remaining ingredients and bring to a simmer for about 15-20 minutes allowing flavors to combine. Serve with cornbread and top with sour cream, if desired. May your 2019 be merry and bright! Looking for something new and delicious for your holiday table? 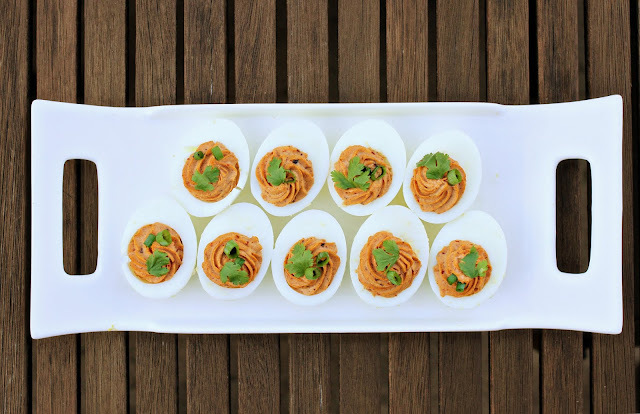 We made these chipotle deviled eggs at Thanksgiving and loved them. A little spicy, but the heat can be tempered by lessening the the amount of chipotle peppers used and/or adobo sauce. I have found the simplest way to get a consistency conducive for piping is to place the hard-boiled yokes and remaining ingredients into a food processor, pulsing until smooth. A pastry bag fitted with a #22 tip (open star) is perfect for deviled eggs, in my opinion. Spooning the filling the old fashioned way is just as yummy. Cut eggs in half, separating yolks from whites. 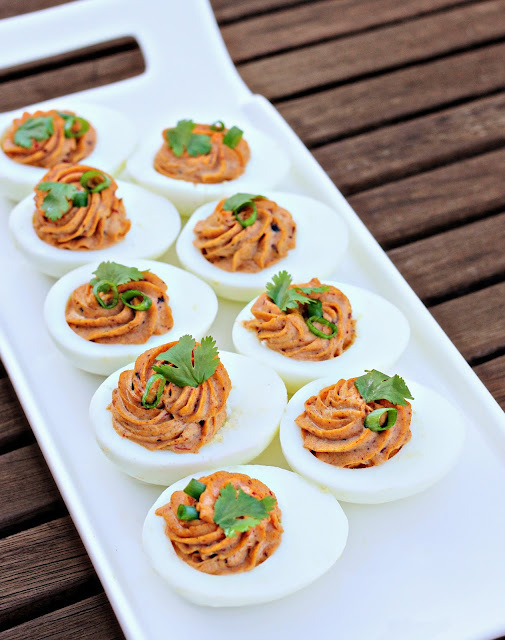 Place egg whites on a platter; place yolks in the bowl of a food processor with mayo, chipotle peppers, and mustard. Pulse yolk mixture until smooth. Spoon into pastry bag fitted with #22 decorating tip and pipe into egg whites. Garnish with cilantro and scallions. Serve immediately or refrigerate in an air tight container.